On Friday, Russell registered his sixth successive 40-plus score in IPL, his knock included four sixes and three boundaries coming after youngster Gill stroked 65 off 39 balls. 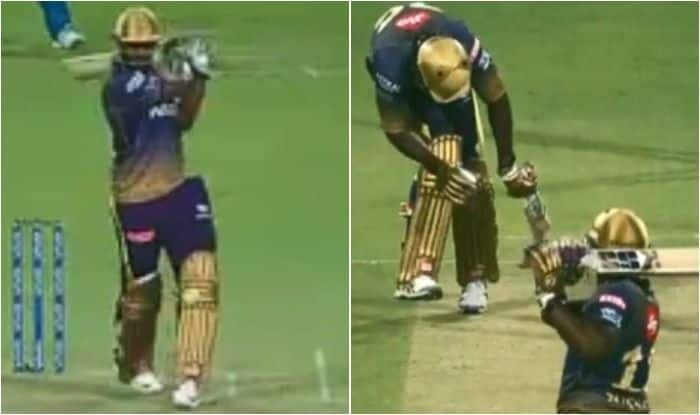 IPL 2019 Match 26, KKR vs DC: Going through a purple patch in the ongoing edition of Indian Premier League (IPL), Andre Russell has literally lit the stage on fire every time he has come out to bat with the wielding willow in his hand. Russell’s brute power and strength were once again on display during the match 26 of IPL between Kolkata Knight Riders and Delhi Capitals. However this time, it’s not only the Delhi bowlers who faced the bait of Russell’s blade but it was his teammate Carlos Brathwaite, who found himself on the receiving end. The 30-year-old blazed away to a 21-ball 45 after Shubman Gill’s brisk half-century, powering Kolkata Knight Riders to 178 for seven against Delhi Capitals. During the 17th over of KKR innings, Russell smashed a half-volley of Chris Morris bowling that caught Brathwaite (non-striker) in the way as he failed to get out of the line of the delivery. This was Russell’s sixth successive 40-plus score, his four sixes and three boundaries coming after youngster Gill stroked 65 off 39 balls. The Jamaican, who was cleaned up by Kagiso Rabada with a toe-crushing yorker in their Super Over defeat in the first leg, also exacted sweet revenge smashing the South African for two sixes in an over that yielded 16 runs. Morris removed Russell in the penultimate over when he was caught in the deep by Rabada. Sent into bat, from batting at No. 6 in their last match against Chennai Super Kings, Gill was promoted to open the innings and the 19-year-old responded with a fine knock, his second IPL fifty, and first this season. Gill smashed seven fours and two sixes, both against spinner Axar Patel, and along with Robin Uthappa (28), added 63 runs after a horror start. Ishant knocked out the off-stump of Joe Denly with a fantastic inswinger, the Englishman lasting just one ball on his IPL debut.